The former chief executive of News International appeared before a District Judge today to hear the charges she faces over alleged phone hacking read out in court. The 44-year-old spoke to confirm her name and other personal details during her brief appearance. Brooks, who has also edited The Sun and the News of the World, is accused of conspiring with others to illegally access voicemails. She is also accused in relation to Milly Dowler and former union boss Andrew Gilchrist. 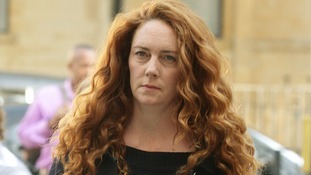 Brooks was granted bail to appear with her co-defendants at Southwark Crown Court on September 26. Brooks is already due at Southwark Crown Court on September 26 to face three charges of conspiring to pervert the course of justice. That relates to the alleged removal of material from the News International archive and trying to conceal documents, computers and other material from police.